The modern autostrada that runs from Naples to Avellino is the A-16. It moves very quickly away from Naples, the Tyrrhenian coast and the Campanian plain up through the valley of the Clanio river. The road passes through a tunnel at 600 meters and then down between Avellino on the right and the height of Montervergine and the Partenio National Park on the left. The town of Benevento is straight ahead and you start a long descent to the other side of the Italian peninsula and the Adriatic. The distances are not that great. You can drive from coast to coast in under two hours. There was a time in the history of the Italian peninsula when various large cohesive cultures were competing for the same territory: the Etruscans, the Greeks, the Samnites and the Romans. (That would be from about 600-300 BC, and if you stayed awake in European History, you know how that turned out.) There were, however, smaller and less expansive groups of people who just sort of settled in their towns and stayed put, waiting to see how it all would turn out. Sometimes the towns got stuck in the middle. Avella was one of those. The name itself is vague. It might even come from the same root that gives us the word "apple" and similar forms in other Indo-European languages. (More important than apples, however, is the common hazelnut, the botanical name of which, indeed, is Corylus Abellana, from the Roman name for the town, Abella. Even Virgil said that the area wasn't much for wheat and other grains, but, Holy Hercules!, they sure had great hazelnuts! There is evidence of human presence along the Clanio river around Avella since the late Paleolithic. Fragments and funerary items from around 700-600 BC show that there was trade going on with the Greeks who had just started to settle along the Campanian coast as well as with the Etruscans who were already in Capua. There are also a great number of "native" items—that is, from the Samnites, the large Oscan Italic tribe that dominated the area. Ethnically, then, we can say the Avellans of that period were, indeed, Samnite Oscans. By the 300s BC, after the grand Samnite-Roman conflicts had shaken out in favor of Rome, "Abella" had become a Roman municipium; that is documented in an inscription called the Cippus Abellanus, a treaty of alliance between the citizens of Abella and those of Nola. The document contains reference to a joint construction of a temple to Hercules and is presently kept at the archaeological museum in Nola. It is notable because it is one of the longest we have in the now extinct Oscan language of the Samnites (similar to Latin). The Social Wars came along around 90 BC; they were a series of conflicts between Rome and some of the "other" Italic peoples, remnants of tribes not-yet totally mopped up by the Romans. You could line up on one side or the other. Although Abella/Avella chose wisely (ultimately) by remaining loyal to Rome, that antagonized the Samnites still holding Nola next door, for which they destroyed Avella. Because of its important location, the town was rebuilt in 87 BC and actually was an important cultural center throughout the Roman empire. Vespasian (emperor from 69-79 AD) settled a number of ex-soldiers in Avella, granting them parcels of land as part of the program known as "centurianization." The rebuilt Roman Abella is estimated to have been about half the size of Pompeii—a sizable town. The town was sacked by the barbarians in 410 AD and again in 455 AD but rose again under the Lombards, who, in the seventh century, built the first version of that castle on the hillside. The castle was later refortified during the Middle Ages by the Normans, Hohenstaufens and Angevins. There are significant Roman archaeological remains in the area, including the amphitheater (photo, above right), built shortly after 87 BC, apparently by Roman dictator, Sulla, as a reward to the town for having stayed with Rome during the recent Social Wars. 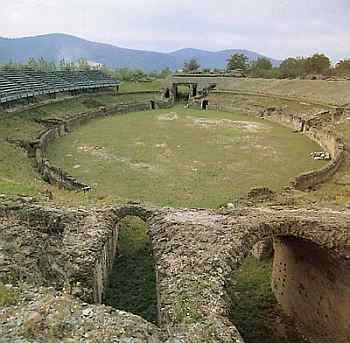 There are sections that were clearly meant to be built out as spaces for animals, which would have put the arena on a grander scale, similar perhaps to that at Putealanum (Pozzuoli). Those sections remained unfinished. From the old Roman center, there are signs that direct you to the "Norman Castle," "Amphitheater," and "Necropoli." There is also an "Antiquarium," which in many places is called an "Archaeological Museum." It is still small, but they are working on it. Nearby, there are a few grottos of significance to spelunkers, geologists and other troglodytes.